This superb box is a wonderful successor to Ondine's similar 4 CD venture for the eight symphonies on ODE1145-2Q. The two sets make ideal companions. Rautavaara's artistic journey is always powerful and often directly accessible, nuanced and patently sincere. The four CDs (...) will expand your love for the 81-year-old Finnish composer's oeuvre far beyond his wondrous, best-selling "Cantus Arcticus" Concerto for Birds and Orchestra. Every one of these pieces (...) are well worth getting to know. (...) the performances are all first rate (...) the orchestral accompaniments leave nothing to be desired either, and the engineering is uniformly excellent. Like the German composer Paul Hindemith, Finish composer Einojuhani Rautavaara loves composing concertos with diverse instruments. You get to hear them all in this stimulating collection (...). This is the only collection of his concertos and it is splendidly performed. 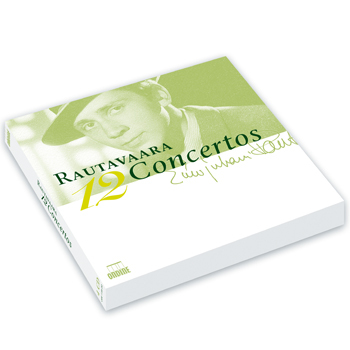 This edition of twelve concertos by Einojuhani Rautavaara follows on the great success of the release of his eight symphonies, in a collectors' box set. Ondine's long-time house composer is recognized as one of the greatest musical figures in Finland after Jean Sibelius. Between 1968 and 2001, he wrote solo works with orchestra for the violin, cello, double bass, harp, flute, clarinet, organ and the piano. Highlights include the Violin Concerto which won a Cannes Classical Award in 1998, the Concerto for Birds (on tape) and Orchestra "Cantus Arcticus" which remains Rautavaara's most popular and most frequently performed work of any kind, and the Third Piano Concerto "Gift of Dreams" which was commissioned, premiered and recorded by pianist-conductor Vladimir Ashkenazy. The list of featured star performers also includes Patrick Gallois (flute) and Richard Stoltzman (clarinet). This compilation does not include the more recent Percussion Concerto (2008) and Second Cello Concerto (2008-09), released both on a later recording (ODE 1178-2).